This EV setup adds off grid power for base camp and auxiliary power when parked at home. With an available app its also easier park without using a vehicle like Tesla summons. This camper is useful off grid and home for the power grid. 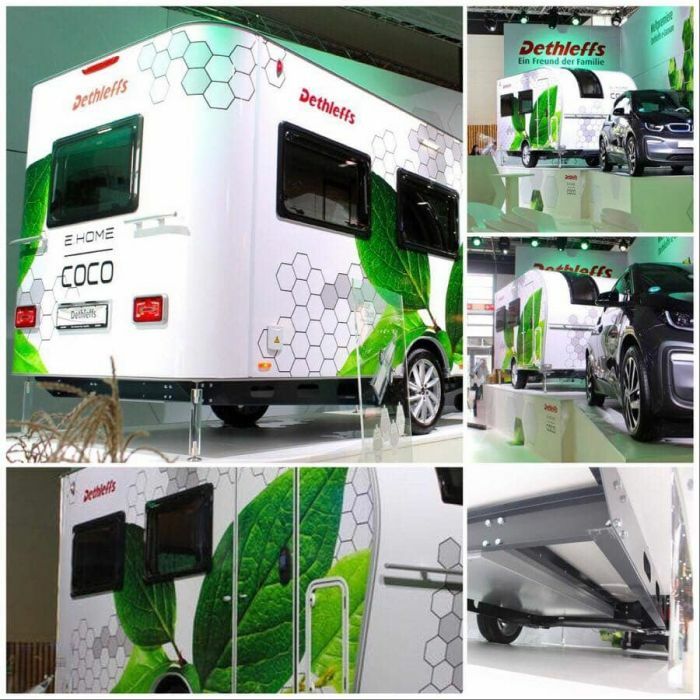 German camper Dethleffs has come out with another EV camper prototype, this one perhaps a bit more practical and closer to being a production model, than the Type 3 RV EV camper with wall to wall solar panels they introduced last year, and that was a pretty nifty idea. What makes this model more practical and having a better shot of making it to production is that this time they used one of their production models to make it an EV prototype. But you can still tell that battery technology is not where we need it to be to maximize efficiencies in the EV camping world. But this camper has a better shot of becoming reality with the not far fetched at all state of the art updated features it already has. The Coco is a standard caravan RV trailer with dimensions of about 2 by 4 meters with berth configurations for 4 to 6 people. You can tell that Dethleffs gave lots of thought to the design to the EV version with this build. And even though they electrified the two wheeled chassis, there’s several reasons why they did that. If this camper los for the EV market, most likely the car that’ll tow it will also be an EV. Given the atrocious ranges EV’s revert to when towing anything, having the caravan power supplanted will help not only with the towing car’s range, but it also opens up options and possibilities not contemplated before. With the torque vectoring management system that works similarly to AWD to give power to each of the wheels when needed, it makes this somewhat large RV trailer a lot more easy to handle on the road, and awfully a lot light lighter to tow, especially with some of these smaller electric cars that’ll most likely be towing it. So with the powertrain system that’s more powerful than the Tesla Base Model S, pulling an 2000 lbs trailer with the electric power assist and torque management will in effect make the trailer about 200 lbs of tow capacity. There’s an available app that once the caravan is on site and detached from the vehicle, you can use the app to maneuver the camper like Tesla summons mode to the perfect spot on site. And once you set up camp, this is where things really start to shine for e.Home Coco that you’re going to love. Between the two motors and the battery pack that stays charged with the roof solar panels, you now have options for camping that you wouldn’t normally have with regular camping under most circumstances. Instead of having a noisy gas burning generator, you have a quiet off grid electrical power reserve at your command at campsite, to make things that were once impractical like HVAC available for inside the camper, or having appliances like a food processor, or having all your electronic devices plugged in at campsite, once considered luxuries, now possible features. As I research these campers, one of the things I’m starting not to like about them is once the trip is over, the rig gets parked on the side of the house or property or put into storage that’s essentially wasted space. You put a tarp over the thing and it just sits there melting in the sun until the next camping trip. One of the things I’m starting to see and like is when the camper build is either flexible in its design to be used for other applications, or when the build can serve other purposes. I like a camper you can take out the galley and bathroom and use the conversion van it’s made from back into either a cargo panel van or an airport passenger van for soccer mom mode. Or when the camper is some sort of Swiss Army knife. E.Home Coco is one of those campers. When you get home you can still park the caravan on the side of the house, but in this case you can connect the camper to your power grid as auxiliary or backup power supply. This is Dethleffs’ ongoing process of trial testing new products to see what combinations will be the best at market. Further testing will be conducted next year, so stay tuned for updates! What do you think of this EV camper build? Let us know below.